While most 13 year olds are busy trying to raise enough pocket money to buy the latest gadgets, Summer Henderwood has something a little more philanthropic on her mind. The year 9 Wellington East Girls’ College student is busy trying to raise the $1500 needed to see a library established in Cambodia. Money raised by the Island Bay teen will go to Books For Cambodia, a charity which works to establish libraries with trained librarians in primary and secondary schools in Cambodia. 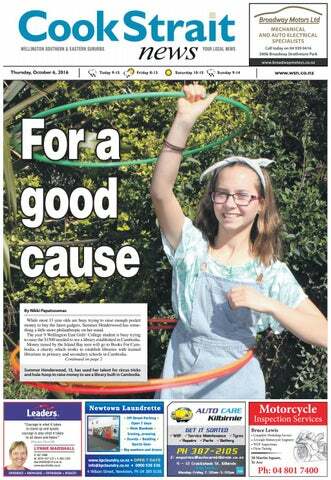 Continued on page 2 Summer Henderwood, 13, has used her talent for circus tricks and hula-hoop to raise money to see a library built in Cambodia. For a good cause Continued from page 1 So far the charity has seen 10 libraries established at schools in the Takeo Province of Cambodia. Summer said since she was just 10 years old she has been working towards her goal and having raised $900, she has now organised a garage sale for the weekend in an effort to finally reach her target. She said she first learnt of the charity through family friends. “Me and my friend Poppy Voon then went out and did some hula-hoop busking with circus tricks,” she said. After three years of diligent fundraising, Summer is close to reaching her goal, and said she hoped to raise the remaining money at this weekend’s garage sale. The garage sale, which will take place at St Hilda’s Church in Island Bay, will have a variety of household items and clothes on offer as well as home-made lemonade and baking. Summer said all her hard work was worth it if it meant putting a smile on the faces of children less fortunate than her. “In Cambodia it’s not like in New Zealand. They don’t have lots of books and I think a lot of people take for granted how great it is to have books and libraries. “It makes kids really happy; they love books and really appreciate it.” Summer said once she reached her goal she would start fundraising again for the next library. Newtown Dental Surgery has been Hygienists providing dental care for families at Nur Niaami BOH (Otago) the Lychgate Centre for over 25 years. ing; it’s about keeping smoke away from certain spaces and from other people and their belongings. “We are just asking smokers to have respect for their neighbours who don’t smoke, and for the property they live in.” He said council staff would be taking a compassionate approach to the change, and would be offering tenants support. Crafty locals or those with a little Kiwi ingenuity now have the ability to hire a range of tools in their own neighbourhood. Last weekend, the Newtown Tool Library officially opened its doors at its home at the Newtown Community and Cultural Centre. Founder of the Newtown Tool Library Natalia Lombardo said the project had been in the pipeline for six months. She said she was inspired after reading about the success of tool libraries overseas, especially in America. Natalia said the concept was simple. “If we could all collectively own tools then no one has to have their own or spend a lot of money buying tools they are not going to use that often.” To borrow one or more of the 145 tools available at the library users needed to become a member of the library, for a small yearly fee, she said. Natalia said those interested could also use Wellington Timebank credits to pay for their membership. Membership would give users access to a wide variety of tools including hammers, power tools, gardening tools and even craft tools. Safety gear was also available for people who hired power tools. Members could then visit the library on a Wednesday evening or a Saturday and hire out the tools they needed for up to a week, with an opportunity to renew them. “We are trying to make it as accessible as possible while still having a little bit of income to pay for repairs,” she said. Natalia said they were able to get off the ground with a large amount of donated tools, as well as some funding. Wellington Newcomers Events Wellington Newcomers will hold a series of events over the coming months. Head along for a coffee and a catch-up on Wednesday, October 12 at 5pm and on Thursday, October 27 from 2.30pm at Central Library at 65 Victoria Street. Upcoming workshop Head along to learn more about Esogetic Medicine with Moira Aberdeen at KoruHub, on Sunday, October 9 from 3.30pm to 5.30pm. You must book in advance for this free presentation. To make a booking call 383 5757. Airport extension application back in process Wellington International Airport’s runway extension resource consent application is back in process. Last week, Wellington Airport announced it would request the Wellington City Council and the Greater Wellington Regional Council re-start its application for consent to extend the airport runway by more than 350 metres into the Cook Strait. inbrief news Play space growing Get ready to rock, roll and slide. The community garden and play space next to Island Bay Presbyterian Church is only one working bee away from being open for the whole community to enjoy. Once purely a memorial garden, it has been transformed with slides, a scooter path, a large dinghy and climbing rocks. This Saturday, October 8 there will be a working bee to prepare for sowing grass. Minister Nathan Parry invites the community to come and muck in for 30 minutes to help out. The working bee will take place from 10am, at 88 The Parade, Island Bay. Children are welcome. Voter turnout As of Tuesday afternoon, only 30,254 people out of 141,904 Wellingtonians have voted in the local body elections, with voter turnout at only 21.11 per cent. Thousands more are expected to post their papers in the last few days of voting. Voting closes at midday on Saturday, October 8. Fitness dance classes that whisper exercise and shout fun!!!! all classes at Shelly Bay, Miramar This creative and different form of exercise will energise you and leave you with the ‘after-glow’ of exercise and a sense of mastery and conﬁdence. Using both new and older music it is unimaginable fun plus improves your cardiovascular ﬁtness, strength and endurance along with other important ﬁtness components. Phone Lynne on 04 934 3920 or 0274 416 079 or email: lynnebreed@clear.net.nz Term 4 starts Tuesday 11th October 2016 Morning & evening classes Tues & Thurs Book now and get your ﬁrst class free! Check us out at www.meetup.com under 'Shelly Bay Fitness Dance' Or ‘Shelly Bay, Fitness, Fun and Body Changing” Late bookings welcome. Among the 13 streets affected were parts of: Akaroa Drive, Arahanga Grove, Aramoana Place, Aranui Street, Booth Street, Brussels Street, Countess Close, Duchess Place, Maupuia Road, Tauhinu Road, Ropa Lane, Waiwera Cresent and Zaida Way. Stella Reid places her vote in a ballot box at the Wellington City Council on Wakefield St. Newly opened in Miramar Metro Centre! METRO MIRAMAR SEAFOODS Do you need a fantastic, inexpensive website, that will be easy for you to manage once it’s yours? Trish Given and Tania Austin outside the new Mt Victoria Community Hub on Elizabeth St.
to spend on working towards events for the community. “Change is a hard thing and getting around the fact that we are no longer a community centre… But if people can see the bigger picture on how we are trying to support other organisations, it is really quite exciting.” Trish Given will coordinate the new space, which she said was already more accessible and more visible in the community. “It has generated a huge amount of interest and curiosity,” Trish said.  The Mt Vic Community Hub is located at 24E Elizabeth St. For more information head to www. crossways.org.nz or the Mt Vic Hub Facebook page. Ross Jones in his glass art studio in Strathmore Park. Miramar Golf Club benefits: • Join competitive or social competitions • Enjoy our clubhouse cafe and bar facilities. • Invite your guests for lunch or a drink • Access to excellent golf professional for all golf equipment and lessons. • Buy a lesson in a covered all weather purpose built coaching bay • Free car parking at the club car park for guests and players. Application form on website. about 10,500 feet, police said. Both pilots suffered headaches and had their vision temporarily obscured as a result of the strike. Despite the strike, the plane landed safely, police said. Police believed the laser light came from the Trentham area, south of Upper Hutt, near the motorway. Police were now asking for the public’s help in fi nding those responsible and asked anyone with any information to call 111.
between gardening and staying well and recovery. “Experience the joy and relaxation that is gardening and plant some vegetables for the community to enjoy, meet some neighbours and sow some seeds to take home,” she said. Activities include: • A concert by the Ukes of Wellington, plus tips from them at a workshop. • The chance to get up close and personal with the Central Library’s collection of rare books. • Meeting the famous HipOperation dance crew, trying some of their moves, and hearing from their inspiring manager. • Going behind the scenes of Parliament, National Library and Government House. • Taking part in a dementiafriendly tour at Te Papa. For more information or to register, please contact: John Nimmo, Phone 476 8771, email john.nimmo@xtra.co.nz or Franci Stapleton, Phone 972 1990, email fes@paradise.net.nz And check our website www.seniornetwgtn.blogspot.com Regardless of how much you know, there’ll be something here for you. Join us for tea or coffee and a Noel Leeming Learning Specialist will discuss and demonstrate how we can use and enjoy evolving new technology, and how we can manage our tablets, iPhones, smart phones, and other new devices for best results, and benefits. We share knowledge, learn together, and have fun. Subscriptions, course, tutorial, and workshop fees are modest. Sosefa Havea with a piece of art he will show as part of his exhibition this Saturday. this was the first time he would exhibit his work. His exhibition is made up of 28 pieces which interpret contemporary indigenous thought and form using traditional Tongan tapa cloth and inks. “The message I would like to give is to highlight the Tongan contribution not only to academia but also to art and literature.” Sosefa’s pieces touch on traditional Tongan practices, giving viewers an insight into his genealogy. One piece explores the Laka Laka, the Tongan master of performing arts which he described as a reflection of genealogy in motion. Another reflects the Tongan Royal Kava Ceremony which he said celebrated the connections and relationships between and amongst Tongans. Sosefa, who moved to New Zealand in 1988 to study at Auckland University and then settled here in 1994, said he hoped the exhibition would inspire people to learn more about their background. “I am really interested in seeing the community re-visit and reactivate their genealogy or whakapapa. I want to inspire the community to get to know themselves,” he said. “I am involved with the community and that is why I think I should share it with my community – I may inspire students and young ones in the community.”  Lapita People will run this Saturday, October 8 at the Strathmore Park Community Centre from 11am to 4pm. Modern day surveillance is the topic of the first novel by Wellington author Logan Ritchie. Ritchie’s young adult novel “Like Nobody’s Watching” is about a group of high school students who hack their school’s surveillance system, to catch footage of bullies to use as blackmail. Logan said he first had the idea for this book when he was a student at Wellington High School, and a CCTV surveillance system was installed to stop vandalism. The idea developed further when he was studying media studies at Victoria University and the topic of surveillance was covered in one of his papers. After finishing his degree, Logan trained as a teacher and learned more about school surveillance, such as positioning of staff rooms so teachers could see the playground during breaks. “I was seeing it from the other side,” he said. From there, Logan said he completed a lot of research around the theories of surveillance to write his first book. “It was around the time of ‘Snowden’ and ‘Dirty Politics’ so it was quite topical,” he said. As part of his research he was able to interview Nicky Hager, author of ‘Dirty Politics.’ Through the writing process the book evolved into a story very different from what Logan had originally planned. “It got really dark,” he said. Sheepskin Specialist NZ Made Sheepskin Rugs, Slippers, Possum, Merino, Knitwear. Matt Dagger Matt is General Manager of Kaibosh - New Zealand’s first food rescue organisation. Kaibosh rescue quality surplus food and provide it to community groups supporting those who need it most. Matt will be speaking on food waste and food rescue. Order your Gantry Skip Bin online at www.envirowaste.co.nz or give us a call on 0800 240 120. Q: What qualities make a good mayor? to abridge letters or withhold unsuitable letters from publication. Send or fax them to the address on page two, or email them to nikki@wsn.co.nz. Please note that your name and street address must also be provided in e mails. Free Computer Fixit Day for community 2 FOR 1! Locals will have the opportunity to have their computers fixed for free at an upcoming event. Due to the cost of repairs to home computers, Wellington South Baptist Church in Island Bay will hold a ‘Computer Fixit Day’ next month. This is an annual event that is in its fifth year. The event is designed to help anyone who cannot afford computer repairs and is open to anyone who has problems with their computer. Organiser for the event, Fred Alvrez, said locals did not have to be part of the church to take advantage of the free service. He said locals could tell computer engineers on hand what was wrong with their device and leave their computer behind. your computer. Fred said all expertise and software would be free. “It is only if you have a hardware problem where the engineers will try to diagnose the issue and can advise you, but they will not have any spare parts on hand to fix this type of problem.”  Computer Fixit Day will take place at Wellington South Baptist Church, 282 The Parade, Island Bay on Saturday, November 12 from 9am to 4pm. You only need to bring along your computer box – not the screen, keyboard, mouse or cables (unless you are having an issue with one of those items). If bringing a laptop don’t forget the charger. For more information call 383 6888. Te Papa closed on Christmas Day From this year Te Papa will be closed on Christmas Day. The museum will continue to open from 10am to 6pm every other day of the year. The museum has opted to close on Christmas Day to enable staff to celebrate the day with their family. In past years, Te Papa staff including hosts, cafe and retail staff and cleaners had been rostered on to work Christmas Day. Te Papa Chief Executive Rick Ellis said the decision was about being true to the museum’s values. Southern ward councillor Paul Eagle said his hoardings have been repeatedly vandalised. A local councillor is taking the vandalism of a number of his election hoardings on the chin. Southern ward councillor Paul Eagle is once again standing for council in this year’s local body elections. Paul said while feedback from the community was always mostly positive, several of his campaign hoardings have been repeatedly vandalised with the word “bully”. to do. “People may not want to vote for me, but I still want them to vote.” Paul said one thing was for sure, there was an “impressive artist out there”. “We have had Maori moko, we have had other swear words and we have had the usual phallic symbols. “I spent five years in art school and some of the art work I have seen around should be better channelled,” he laughed. • Fully renovated, with two bedrooms and garage. • Opportunity beckons as the vendors have purchased and want a sale on auction day! DO YOU HAVE A SEA VIEW FROM YOUR HOME? Recently Harcourts have had amazing success with properties that have a view of the ocean. For example we sold 409 Karaka Bay for $1,065,000 which was over $300,000 more than the RV. Please call if you are considering selling. Katie Underwood Katie Underwood works from the Leaders City office. Katie said she believed in keeping her clients, whether they were a vendor or buyer, fully informed from start to finish, so there were never any surprises. With a working background in risk management, computer software and education sales, Katie said her portfolio of sales included many satisfied clients who have achieved a premium price by using the Leaders proven sales techniques and systems. This was evident through the number of awards the Real Estate Agent has picked up throughout her career. The born and bred Wellingtonian said being involved in the community was important to her, so she remained involved in a number of conservation organisations as well as her local residents’ association, The Brooklyn Residents’ Association. Katie said her love of the city allowed her to get her clients the best price possible for their homes. REAL Aotearoa gallery store has a collection of glass, jewellery, wood, greenstone and iconic artworks from New Zealand Artists. chilblains which occur in winter months as our circulation slows in the cold. Toenails can become painfully ingrown this time of year from crowding in shoes. Dr Halpine offers both quick pain relief options as well as a surgical correction to rid you of the problem permanently. Phone 04 473 8696. Fresh Fish, New Zealand Lamb, Free range Pork, Free range Chicken, Nelson superior Salmon, Cakes, Bread, Pizza and Focaccia daily baked! An International Food Market with an Italian flair!!! >> Coffee by ‘Old George’ >> Blackboard menu changing daily >> Selection of local & imported cheeses and small goods >> Take home meals >> Fresh squeezed juices >> House smoked fish and meats >> Functions and catering available. Chitwah the Whitaker’s Skink at The Nest at Wellington Zoo. habitat loss are a big threat to their survival. Whitaker’s Skinks are rare in New Zealand as they are only found on Mercury Island, Castle Islands and locally in Pukerua Bay. Amanda Tiffin, practice manager at The Nest, said skinks played an important role in gardens as they were insectivores who loved eating pest invertebrates like moths, small slugs and other insects. After being treated at The Nest for the past five months, Chitwah’s tail has started to grow back and the skink had reached a healthy weight. “Our vet team made the decision to house the skink over winter so she could continue to gain weight, avoid brumation which is a reptile’s version of hibernation, and therefore have the best chance at survival,” said Amanda. “Leading up to Chitwah’s release, we started to acclimatise the skink to the outside temperature so that she could transition back to her habitat without any issues.” Chitwah’s carer, Dennis Keall works with the Department of Conservation to breed endangered native reptiles and has one of the most successful breeding programmes for native skinks and geckos in human care in New Zealand. Amanda said the community could help protect native reptiles by creating lizard-friendly habitats in their gardens, through planting native trees and shrubs, as well as providing shelter from small introduced predators like cats. Walkway a journey through Wellington’s history A recently opened walkway will journey locals through 32 of the city’s most important and historical sites. Wellington’s Commonwealth Walkway was completed last Monday, when the final commemorative walkway marker, or roundel, was placed by Mayor of Wellington Celia Wade-Brown, Governor-General Dame Patsy Reddy, Sir Anand Satyanand, Chair of the Commonwealth Foundation and Isobel Pepper, a member of the Commonwealth Youth New Zealand executive. The walkway connects 32 significant monuments, parks, buildings and historic places along a 9km loop in the capital. The final route included community suggestions on points of interest to add to the walkway. Ms Wade-Brown said she was delighted to see the walkway completed in her final week as mayor. “The first roundels were laid in 2015 as part of our Wellington’s 150th anniversary celebrations and this walkway is a wonderful way to celebrate the long shared history between the crown and the city,” she said. The first marker was laid at the Wai-Titi Landing at the front of parliament grounds in July 2015. Prince Charles and Camilla laid the second roundel in November 2015 at Pukeahu National War Memorial. “As such a walkable city, this gives Wellingtonians and visitors another reason to explore the capital and enjoy its rich history and beauty and to get active and get walking,” Ms Wade-Brown said. Dame Patsy Reddy, who was sworn in as Governor-General last week, said the walkway told a story of Wellington and the people, places and events that were important. “Around the world these walkways are transforming people’s experiences of their cities. It’s a novel way of encouraging people to get outside and take a closer look at the things that surround them.” The Commonwealth Walkway concept was developed by the London-based Outdoor Trust, which has permission from Queen Elizabeth II to use her personal EIIR cypher to mark the walkway adjacent to agreed points of interest. An app was scheduled to go online at a later date, providing information about the 32 points of interest along the walk. flavour, to the sauce, to bits and pieces of their favourite chocolate bar or biscuit. The shop will also feature a dai ly offering of Sweet’s famous cakes, cupcakes and treats, in a huge range of flavours. with the vibe of Cuba St. “Our customers have also been demanding a spot in town, to pick-up our famous cupcakes, for a long time now.”  The shop will open its doors this Saturday, October 8. Local artists Damin Radford-Scott transformed the old dilapidated Lyall Bay Surf Club rooms into a work of art last week. SECURE STORAGE 14sqm $42 per week. teachers. Fun, modern, mobile lessons. P. 021565750 rates. Free quotes. Phone 04 977-7850 or 027-451-5005. by competent and considerate Tradesmen. Realistic Wainui SelfNeil Storage, Waiu St, 0274805150. rates. Phone 388-7518 E. geoff@therockacademy.co.nz LICENSED BUILDERS all types of work underComposed by Tony Watling 11th. Nov. 2015 TradesGARDEN and Services taken. Phone 3838274. GROUNDCOVER MAINTENANCE. Public Notices Caring for your garden: • General maintenance • WeedFOR ALL• Planting ELECTRICAL • Pruning • One-Off jobsrepairs • Regularand care PAINTING TEAM ing by top-qualifi electrician with •installations Experienced Gardeners. Phoneed Julie on 0273324896. Exc. Refs. Comp. Enrolments 2017 51. J.K. Rowling The Board of Trustees has made chose the 12 places for out of zone available students in 2017. unusual name These places are at any year level ‘Hermione’ of the school Year 1-6. If you wish to soregister youngyour interest please submit a request via email including the girls name, address and date of birth of wouldn’t the enrollee. be teased for beingmake application for Please enrolment by Friday 14 October nerdy! Ph: Open SatNZMP 9am-3pm In 5685989 Conjunction with we Formerly cpa spares offer a 5 year warranty. By Russell Russell McQuarters McQuarters By By Russell McQuarters By Russell McQuarters 38.N.Z. N.Z.novelist, novelist, Frank Frank... ...(8) (8) 53. Lucid Lucid (5-6) (5-6) ACROSS 38. 53. ACROSS (abbr) (3) 51. Angry (5) ACROSS 41. Erect again (7) 54. Hard wearing cloth (7) (7) 1.Conniption Conniption(7) (7) (abbr) (3) (7) 51. Angry (5) ACROSS 41. Erect again 54. Hard wearing cloth 1. 33. Sphere (3) 52.52. Solidify by by cooling (7)(7) 1. (5-6) 33. Sphere (3) (7) Solidify cooling 1. Result (5-6) 43. Make bigger 5. Result Variety cabbage (11) 43. Make bigger (7) Derby (8) 5. ofofcabbage (11) 38. U.S. horse race; 53. Anaesthetic (5)(5) 7. Variety Scoundrel (7)(5) 38. U.S. horse race;... ... Derby (8) 53. Anaesthetic 7. Scoundrel (7) 44. Forges’ air-blasting DOWN 11. Of the nose 44. Forges’ air-blasting DOWN 11. Of the nose (5) 40. Restrained (8) 54. Humbleness (7) 11. Pulls (5) 40. Restrained (8) 54. Humbleness (7) 11. Pulls (5) apparatus(6) 1. Fillip (5) 12. Wicked (7) apparatus(6) 1.55. Fillip (5) 12. Wicked (7) 42. Casual (7)(7) (6) 55. (11) 12. Deviousness (7) (7) 42. Casual Friendship (11) (7) Deviousness 45. Exert oneself 2. Friendship Quack medicine 13.12. Travel by car (5) 45. Exert oneself (6) 2. Quack medicine (7) 13. Travel by car (5) 44. Annual calendar 13. Excellent (5) 44. Annual calendar 13. Excellent (5) 46. Comedian (5) (7)(7) 3. Type of deodorant 14. Beef stew(made with beer) (9) 3. 46. Comedian (5) Type of deodorant 14. Beef stew(made with beer) (9) 46. Scoffs (6) DOWN 14. Alert (9) 46. Wanderer Scoffs (6) (5) DOWN Alert cheese (9) 47. dispenser (4-2) 15.14. Swiss (9) 47. Wanderer (5) (4-2) 15. Swiss cheese (9) 47. Manservant (6)(5) 1.4.Sound (5)(5) 15. So (9) 47. Manservant (6) 1.dispenser Sound (9) 49. Consumed Uneven contest (8) 16.15. LiftSo weights; ‘... iron’ (4) 49. Consumed (5) 4. Uneven contest (8) 16. Lift weights; ‘... iron’ (4) 48. Form of expression (5)(5) 2. Sent (11) 16. Directs (6) 48. Form of expression 2. Sent (11) Directs (7) (6) 5. Mediaeval guitar (7) 17.16. Disgrace 5.Shy Mediaeval guitar (7) 17. Disgrace (7) 49. Water vapour (5) 3. (8) 18. Skull (7) 49. Water vapour (5) 3. Shy (8) 18. Skull (7) 6. Forearm bone(pl) (5) 19. Circuitous route (6) 6.Of Forearm bone(pl) (5)(6) 19. Circuitous route (6) 50.50. Gambol (5)(5) 4. public revenue (6) 21. Disorder (4) Gambol Of public revenue Disorder (4) (6) 7.4.Revenue (6) 23.21. National song SOLUTION 7. Revenue (6) (5)(5) 23. National song (6) SOLUTION 5. Turn outwards 23. Racket (3) 5. Turn outwards 23. Racket (3) Solution last week,9,282003 September 8. Regreted (8) 26. Lacking good manners (3,4) For ForJune April 30, 2004 SOLUTION SOLUTION 8. Constrict Regreted (8)(7) 26. Lacking good manners (3,4) 6. (7) 25. Take by sips (3) Constrict Take by sips (3) For For June April 30, 9, 2003 2004 9.6.Shaman; (5,6) 29.25. Male deer (4) Solution last week, 11 November For For July April 28, 9, 2003 2004 9. 7. Shaman; (5,6) 29. Male deer (4) For For July April 28, 9, 2003 2004 7. high morals 27. Stake (4) (4) Has high morals Stake 10.Has Of the country (5)(8)(8) 30.27. Born (3) 10. OfReduce the country (5) 30. Born (3) 8. Reduce (6) 8. (6) 28. Artlessness (7) 28. Artlessness (7) 16. Large flat dish (7) 32. Strait (3) 16. flat 32. Strait (3) 9.Large Sanction (7) (7) Low Chaise ... (6) 9. Sanction (7)dish 30. Low chair; ... (6) 18. Leisurely walk (5) 34.30. Melt (4)chair;Chaise 18.10. Leisurely walk 34. Melt (4) ... hand Audacity (5) (5) 32. Expert; ... hand (3) 10. Audacity (5) 32. Expert; (3) 20. Degenerate (7) 35. Slow moving ice mass (7) 20.16. Degenerate 35. Slow moving Arrange in (7) steps Strange 16. Arrange in steps (7)(7) 33. 33. Strange (3) (3)ice mass (7) 21. Female swan (3) 36. Goal (6) ‘Old Blue Eyes’ Frank ...(7) 21.17. Female swan (3) Zealous 36. Goal (6) (6) (6) 17. ‘Old Blue Eyes’ Frank ...(7) 34. 34. Zealous 22. Small barrel (3) 39. Stay (6) Competitor (5) In(6) brisk time(music) 22.19. Small barrel(5)(3) 39. Stay 19. Competitor 35. 35. In brisk time(music) (7) (7) 24. Magician (11)Minister 40. Ceaseless (7) N.Z. Prime U.S. state 24.20. Magician (11) 40. Ceaseless (7)(4) 20. N.Z. Prime Minister 36. 36. U.S. state (4) 25. U.S. actress; ... Ryan...(3) 42. Army canteen (4) (3) 1975-84 Robert Biblical vessel 25. 1975-84 U.S. actress; ... Ryan (3)(7) 42. Army canteen (4) SirSir Robert ... (7) 37. 37. Biblical vessel (3) 27. Lawful (5) 46.39. Twin-hulled vessel (9) 22. Boils (7) Curve (3) 22. (7)(5) 39. Curve (3) vessel (9) 27. Boils Lawful 46. Twin-hulled 28. Smear (3) 48. Trifle (9) (4) Catch (3) Cupid 24. Catch (3) 41. 41. Cupid (4) 28.24. Smear (3) 48. Trifle (9) 31. Cloth measure (3) 50. Deserve (5) 26. Group whales 43. Exposed to air (7) 26. of of whales (3)(3) 43. Deserve Exposed (5) to air (7) 31. Group Cloth measure (3) 50. 33.Topic Male cat (3) 51.45. Autobiographical record (7) 29. Topic Female relatives (6) (7) (5) 45. Female relatives (6) 33.29. Male cat(5) (3) 51. Autobiographical record 37.Uninvited Screen actor (4,4) 52.48. Mythological demon(Arabia) (5) 31. Uninvited guest (4-7) An endless time(Lat) guest (4-7) 48. An endless time(Lat) (9) (9) (5) 37.31. Screen actor (4,4) 52. Mythological demon(Arabia) Deoxyribonucleic acid handed people(inf) Deoxyribonucleic acid 49. 49. LeftLeft handed people(inf) (9) (9) 32.32. Former member of Kiwi Athletics Club Ian Barr reflects on old photos of his time with the club. medallists at the Commonwealth Games, and three All Blacks, Eric Tindall, Nelson Ball and Owen Stephens. Jack said the celebrations will be extra special as they coincide with his 70 th birthday. Perhaps one of the oldest su r viving members of t he club, Ian Barr, will be among those to attend celebrations next week. The 90-year-old who lives at Rita Angus Retirement Village in Kilbirnie said he first joined the club in 1940 and took part in a number of field events including discus, shot, hammer and pole vault. During his time with the club, Barr gained many provincial titles as well as the national junior pole vault title. “It was amazing being able to be the best, the club was quite big in those days. Much bigger than it is now,” he said. “I think kids these days are interested in other sports instead or they are busy looking at their cellphone. Clubs will have to merge soon if they don’t get more members.” He said he was looking forward to the club’s celebration next Saturday evening and hoped to perhaps bump into some old friends.  To celebrate its 90th year, the club will have a special dinner at The Office on Riddiford St in Newtown on Saturday, October 15. Those who wish to attend can contact Peter Jack on 3886334.
times.” She said with the talent in the small group of girls and more interest in the sport, the club expected to grow significantly this year. “The whole coaching team have supported the girls to quickly come up to a standard of swimming they can all be proud of and be recognised for in the national context.” She said the team was also awarded the Club Spirit Award at last month’s nationals, in recognition of the adversity overcome in the successful revival of the club. Justine said synchronised swimming was fantastic for kids as it helped them develop advanced water skills, strength, endurance, flexibility and creative artistry. swimming can contact the club through the Wellington Synchronised Sw i m m i n g Fa ce b o o k page. be for a Heartland Championship union to win it. Imagine what it would do to a place like Wanganui, Mid Canterbury or Buller. It would draw massive crowds and plenty of historical anecdotes from the amateur era. It might be a pipe dream but it’s hard not to argue that the Ranfurly Shield meant the most to people and players, prior to the professional era in 1995. The national provincial competition serves its purpose well of generating New Zealand’s next crop of talented players ready for Super Rugby level. Why not have the Log o’ Wood be the symbol of grassroots provincial pride once again? It would be best for the Shield, best for the game and best for those supporters in the smaller sub-unions. Seatoun Arts and Crafts Annual Exhibition and Sale Village Hall, Forres Street, Seatoun. Fri 14th Oct 7pm-9pm, Sat 15th Oct 10am-5pm, Sun 16th Oct 10am-4pm. Featuring the work of guest glass artist Ross Jones. own relations – we’re like one big family,” Clinical operational manager Brenda Wright said. As the head of activities, divisional therapist Dee Wilkinson, ensured the residents are always happy and entertained with activities running six days a week. Johnsonvale Home hosts themed nights on special occasions including Easter, Valentine’s Day, St Patrick’s Day and birthdays. residents who may need extra care and a Registered Nurse is on-hand 24 hours a day. The home caters for day care and respite care options for people who may need to go away for a week and want to rest easy knowing their loved ones will be well cared for. Brenda encouraged people who are looking for a nice home for their family members to come to Johnsonvale and have a personal tour.